Standup paddle boarding is one of the most fun sports to be picked up by anyone, anytime. It’s meant to meet different needs and orientations, but the best part is how affordable and extremely practical it is especially when it comes to traveling and transportation. 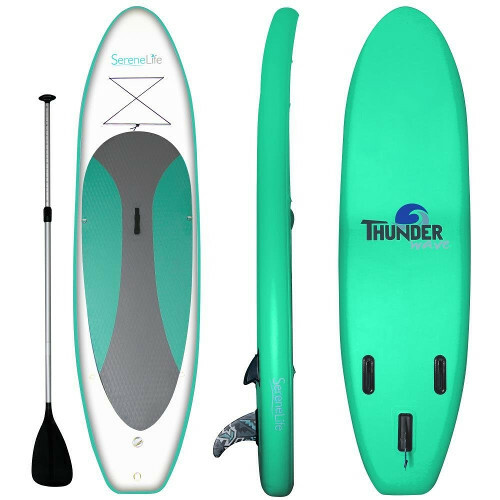 Here, in this review, we’ll talk about the SereneLife inflatable stand paddle board that is designed specifically for beginners who are willing to give it a go with this friendly water sport. With no further due, we’re going to talk about all the specifications that you might need to know as a new paddler before ordering your iSUP. Let’ get it. For a beginner iSUP; the SereneLife meets exactly what it’s expected from it; it’s 10 feet long, 30 inches wide and 6 inches thick, which I find perfect for recreation paddling and touring especially for a learner. The 30 inches wideness of this board allows it to be super stable; this exact measurement reflects that SereneLife kept the learner in their mind while building this piece; because balance is what’s needed most for this scenario. As for thickness, there is no inflatable board thicker than this except for some monster family boards that are defying the norm. That being said; you’re definitely getting the best in the market. Those 6 inches will keep you floating safely with no bending or flexing. The best thing about this board is that it’s not that pricey. Yet, it’s totally strong and durable. The SereneLife is made of military-grade PVC material that is known for making inflatable boards extremely hard and stiff once fully inflated. The drop-stitch technology makes the board’s part feel and look perfectly glued to simulate authentic boards. The details are pretty neat and the board is featured with everything that makes inflatable stand up paddle boarding such a unique and fun sport. The color difference shows on the featured traction pad; it covers what’d be half the board’s back and it’s pretty thick and soft. It’s also diamond grooved as you can see which guarantees maximum anti-skip effect. You’ll also find 4 D-rings connected with a bungee cord on the deck, while another 4 are distributed on the board’s sides for anyone who’d like to use a kayak seat. The 9th D-ring is right on the tail for leash attachment. Furthermore, the SereneLife is featured with a perfect tri-fin navigation system for the best tracking and balance which is what a beginner needs mostly. The central fin is removable and larger than the other two. And finally, you’ll find the standard central carry handle that’ll make it possible to easily carry the inflated board. 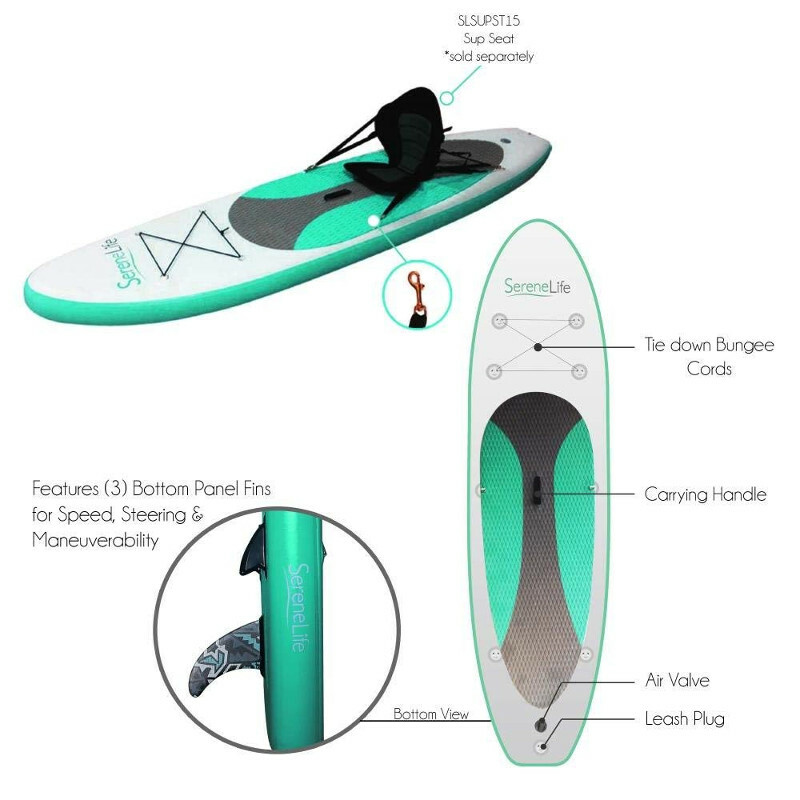 At first, we didn’t want to think of the SereneLife as more than a recreational standup paddle board. However, after trying it; we were very pleased with the performance it effortlessly delivered. It’s stable in both flat and choppy water thanks to its wideness and its navigation system. A beginner can easily and quickly get a whole grasp of how to ride the board and control in a week time. The other thing is that the SereneLife did really good as a touring iSUP; it’s responsive, it glides beautifully and easily on water with minimum effort and it can handle weight just fine as it can take up to 275 lbs. A very nice backpack bag where you can transport or store the deflated board. It’s good quality and it’s really functional. A light weight adjustable paddle that turned to be pretty good and easy to use. For a beginner, you wouldn’t have to think about changing it for a long while as it’ll never drawn and get lost; because it floats. A high pressure hand pump that’ll inflate the board in less than 10 minutes if you gave it a little effort and speed. A repair kit that I hope you’ll never need to use. And a safety leash that’ll come very handy for a beginner. Pretty great package huh? We believe it is, and it’s all very reasonably priced. Number one best thing about the SereneLife is the perfect complete package in which it comes in. 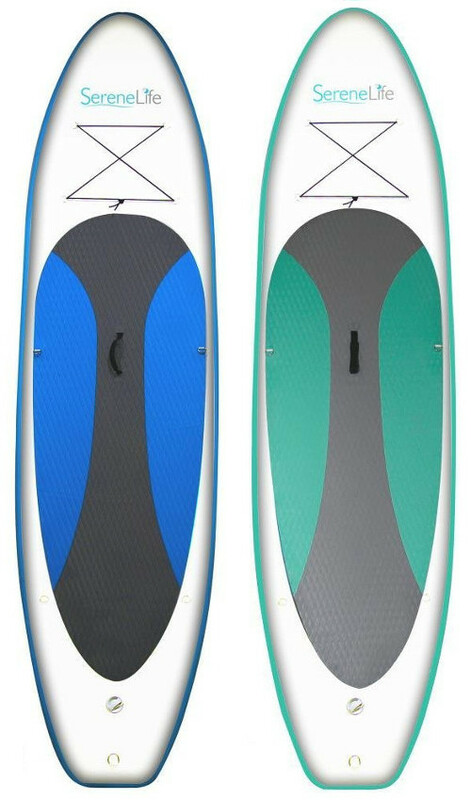 The dimensions of this board are super convenient for beginners who seek to pick up this sport, or for anyone who wants an inexpensive iSUP for recreational paddling or touring. It’s quite stable with those 30 inches wideness.